If you haven’t added webinars to your marketing strategy, you are missing out on a huge opportunity to expand your reach. 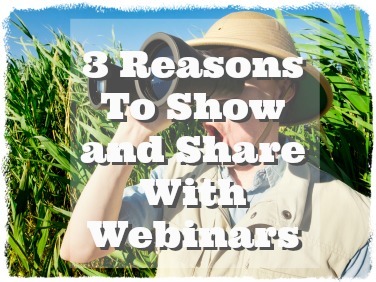 Webinars allow you to show and share a product, service, information, or provide training. I can recall sharing a survey with my email list a few years ago, asking how they liked to receive information. I was hosting a tele-seminar at the time and wanted to get their feedback. While everyone had been to tele-seminars, many had never hosted one of their own. The majority preferred to see something during a presentation, as opposed to just hearing it. At that time, tele-seminars were what most people were doing. Tele-seminars required few technical skills, making them easily accessible to everyone. All you needed was a conference line and a phone. Webinars, on the other hand, require your audience be more technically savvy. It means they need to be in front of a computer or mobile device to participate. 1. A webinar are inclusive of all learning styles. You are familiar with the different styles of learning. Some of us learn by hearing, some learn by seeing, and others learn by actually doing what is being taught. Webinars allow all of this to take place in one setting. It satisfies the different learning styles keeping everyone engaged in the presentation. 2. 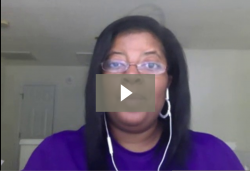 A webinar remove the you vs them, making you a real person to your audience. There is a special connection that occurs when we are able to hear someone’s voice. This connection increases when video is added. Think of your favorite actor or television personality. Do you feel like you know them because you’ve seen them so much on TV? This same feeling is what your audience experiences when they see you on video and even more so in a live webinar. A live webinar offers not editing, special filtering, or modifications. It’s you on your webcam, at your computer, being a real person sharing information that your audience wants to hear. You no longer are a name and words on a computer screen, you now become friend, teacher, motivator depending on the nature of your webinar and how you relate to others. The more comfortable someone is with you, the more likely they are to receive what you have to offer and want more. 3. A webinar extends your reach beyond a local area. If you were to host a live event, attendees would be required to travel to a certain location. This might limit who is able to attend. A webinar removes location and allows you to get your message out to those who might not otherwise hear it. If webinars have not become a part of your regular marketing toolbox, it’s time to start thinking about giving them a try. I’ll take a wild guess and say you already have what you need it’s just a matter of putting all of the parts in place. You have a list- if not use a webinar to get one. You have a product- if not use a webinar to create one. You have a service- use a webinar to demonstrate what you can do. You have a message- share what you know with others via a webinar. A webinar takes the limits and boundaries off. Get back to the basics and identify why you are interested in hosting webinars and start planning NOW.